You spend your whole life being told some place is home, only to get there and realize you don’t really belong. For me, it happened the summer after I turned eight. My mom and I boarded a plane from Canada to England, our first time in Europe. We stayed overnight at a hotel near London’s Hyde Park: its lobby floors a polished wood, the terrifying taxidermy head of a wild cat affixed to the wall. I’d never been in a hotel like this. My parents—immigrants, frugal—generally favored off-the-highway establishments, with buzzy neon signs, and wood-paneled rooms that open directly onto a parking lot. I remember how different the taxidermy hotel was, how there were fresh flowers near the elevators, how Mom and I ordered room service for dinner. A splurge. My hamburger arrived hidden under a metal warming dome, and I remember thinking: this burger costs five times as much as a Big Mac, but does it taste five times as good? 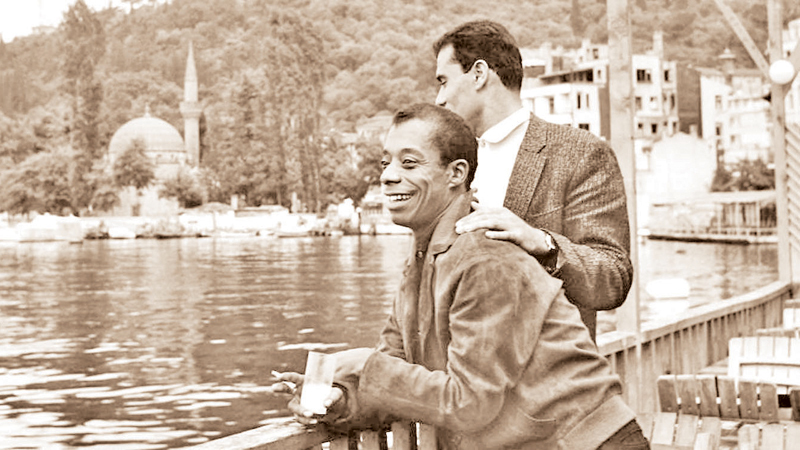 When James Baldwin left home for Europe, he was broke. It was Armistice Day, 1948, when he sailed from New York to Paris, 40 bucks in his pocket. He would say he left not to go to France, but to get away from New York. He left because he had to. His close friend Eugene Worth, a black socialist, had recently killed himself by jumping off the George Washington Bridge, a death that devastated Baldwin, haunting him for years. The only way Baldwin believed he could survive, he said, was by leaving America behind, and so he went to France and, 13 years later, Istanbul. At the time, he was trying to write his third novel, Another Country, but it wasn’t going well. Writer’s block, he told friends. Engin Cezzar, a Turkish actor Baldwin met and befriended in New York, once offered him a place to stay in Istanbul. If you’re ever in town, he said, so one night in October, 1961, Baldwin showed up unannounced at the door of Cezzar’s modest Taksim Square apartment. Cezzar was hosting a party, and was surprised to find Baldwin standing on the welcome mat, holding a beat-up suitcase, his eyes tired, face drawn. Welcome home, Jimmy, Cezzar recalls saying. He told guests Baldwin was an important novelist from America, and there was great buzz. Baldwin came inside, took a bath, and eventually fell asleep in the lap of an actress. According to Cezzar, Baldwin was in crisis when he arrived: sick, and in danger of losing his sanity. The suitcase contained his troubled manuscript. He’d been hammering away at Another Country for years by then, and the story’s failure had taken a toll on him, depressing him, pushing him to consider suicide. But once in Istanbul, Baldwin steadied. Settled at Cezzar’s place, fed and clothed and shown the spare bedroom in the back, he began writing again. In a matter of months, he reworked the book completely, finishing it, polishing it, and producing a novel that was ambitious, experimental, acclaimed critically. A bestselling hit. The film rights would be acquired by a British production company two years later. Before we left London for Istanbul that summer, Mom and I visited Buckingham Palace. It happened to be the Queen Mother’s birthday, so we stood on the pavement outside the grounds, waiting for her to come out on the balcony, which she eventually did, wearing a hat and waving. “HAPPY BIRTHDAY QUEENIE!” I shouted at her, until it started to rain and we left. Inside the airport, I used some of my allowance money to purchase a fridge magnet with her face on it. That summer, my prized magnet was a tool, breaking the ice with my Turkish “cousins,” an assortment of various young people I was said to be related to. I saw a Queen in real life, I would say, and flash the fridge magnet at them proudly until one day, Selim, my much older, anti-establishment cousin, took my Queen magnet and flung it into oncoming traffic. The entire point of being a Turkish person, Selim said, was that you didn’t cow to colonialist outside forces, didn’t express enthusiasm via imperialist fridge magnets. I listened to Selim’s sermon, chastened and solemn. I looked at my treasured magnet lying on the street and thought, Sorry I couldn’t save you, Queenie. I looked a bit longer, feeling sad as a yellow cab accelerated, crushing the Queen’s sweet, plastic little face. When asked why he came to Istanbul, Baldwin alluded to the city being a location of healing for him, presented it as a place in between things, both Asian and European; a city where he could, for a while at least, slip off the various identities assigned to him by others and try to exist in between things too; try to become a human being, was how he put it. In Istanbul, he said, he could begin again. Baldwin’s Turkish decade coincided with the middle of his career not just chronologically, but thematically; years that led to significant artistic growth and exploration. It was while in Istanbul that Baldwin would write his most American works, including Another Country, The Fire Next Time, and No Name in the Street. He would tell friends Turkey had “saved” his life. He would talk about buying a place in Istanbul, settling permanently.